This article first appeared in The Conversation on 09 March 2017. With international rugby referees now making a discernible effort to be better understood when officiating in games where English is not spoken by all those on the field, Queen’s researcher Caleb Keown considers if implementing a bilingual policy would make a difference to the quality of communications during a game. Given that the majority of the high-ranking rugby union teams come from societies where English is the first language, it’s natural that English acts as the game’s lingua franca on the international stage. But world-leading rugby referee Wayne Barnes has recently made clear that he and his colleagues in the Rugby Football Union (RFU), the English governing body for the sport, are making every effort to improve their on-field communication with foreign language speakers. They are even going so far as to take French lessons. This seems like a sound policy – but will implementing it make any difference to the quality of communications during a game? In international rugby, it is vital for captains to be able to speak enough English to communicate effectively, and then translate what the referee says to their teammates. This has been clear in the 2017 Six Nations in the interactions between referees and Sergio Parisse, the Italian captain, and Guilhem Guirado, the French captain, whose capacity to grasp what the officials are saying and relay this to their compatriots is vital to their position. For example, Parisse, who plays his domestic rugby in France, was able to speak in French to the French referee Romain Poite during the England vs Italy game on February 25 – a match in which Italy deployed some surprising tactics. When fluent communication is the aim, it is worth questioning whether anglophone referees will really be able to speak French or Italian better than the players are able to speak English. But officials can all learn rugby union’s “code” in another language – something that language expert Adrian Beard describes as “a language variety in which grammar and vocabulary are particular to a specific group”. In rugby, this means that officials can feel confident using terms which are significant in a rugby match, such as “knock-on” or “ruck”. This kind of communication is insufficient for all conversations between officials and players, but useful for giving instructions or explaining where infringements have taken place. More advanced linguistic skills come in handy when the official has the wherewithal to employ them astutely. 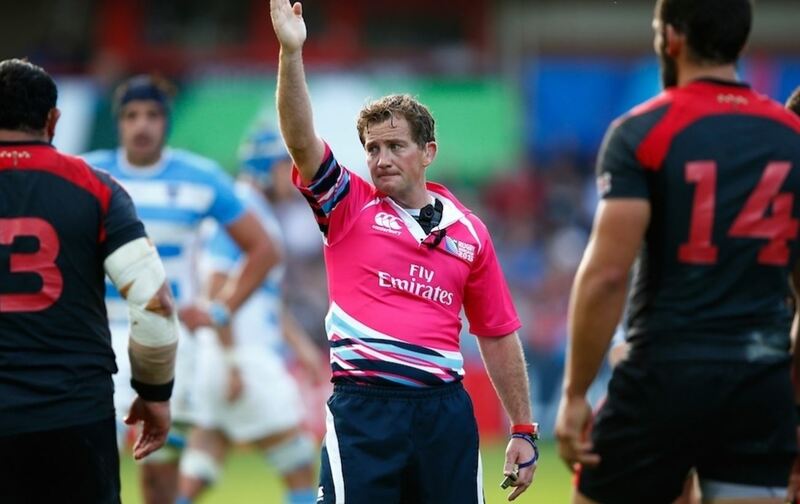 When he took charge of a match between Argentina and Georgia at the 2015 Rugby World Cup, Irish referee JP Doyle chose to address both teams in French. Doyle’s reasoning was that, although this was not the native language of either nation, many of the players had plied their trade in France and therefore were more proficient in this language than English. However, the canniness JP Doyle showed isn’t always replicated in refereeing, where the use of non-standard English has the potential to cause confusion. The 2017 Six Nations has seen some debatable conversations on this front. It is difficult to see how, for example, Australian referee Angus Gardner’s appeal to the French players in their match against England to “stop playing silly buggers” will have meaningfully transcended the language barrier. Colloquial language is often incomprehensible to a foreign language speaker, so officials should have an educated awareness of the dangers of using it. Some degree of bilingual officiating is clearly a step in the right direction for rugby – a sport whose top-level international teams speak a small pool of languages. Not least because the ubiquity of English could make rugby union seem like a closed shop to non-native speakers. The sport aims to create an atmosphere of camaraderie in both domestic and international fixtures where supporters from competing teams are not segregated but encouraged to stand and sit together. In this way, rugby matches between rival nations reinforce, according to Joseph Maguire, an “international diminishing of contrasts” by encouraging the enrichment of relationships between nations and reducing feelings of suspicion and unease towards other nationalities. When sports’ organising bodies choose to not facilitate an improved form of communication which involves other languages than English, it only adds to the notion advanced by the translation theorist Lawrence Venuti that the imposition of cultural values from English-speaking countries has helped to create an imperialistic approach to language. By considering the needs of non-English speakers more tactfully, and in doing so not putting them at a disadvantage, rugby union can augment its reputation for respect between cultures and beyond the post-match pints. Caleb Keown is a PhD researcher in Translation Studies in the School of School of Arts, English and Languages in the Faculty of Arts, Humanities and Social Sciences. He has a BA in French and Theology from Queen's (2013) and completed a Master's in Translation Studies the following year at the University, during which he gained a further qualification in Community Interpreting. Caleb started a PhD in Translation Studies in 2015, researching sport from the point of view of translation studies as a place of interlingual and intercultural encounter. For further information contact Caleb Keown, visit his web page or follow him on Twitter. Media inquiries to Gerry Power, Communications Officer, Development and Alumni Relations Office at Queen’s; tel: +44 (0)28 9097 5321.